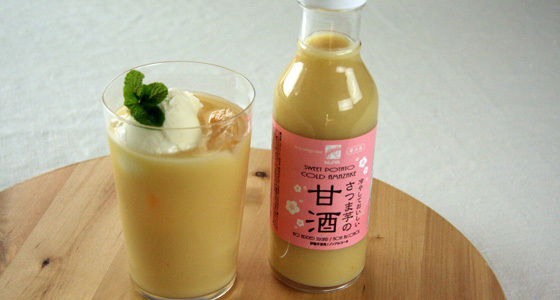 Nijiya Handmade: Sweet Potato Cold Amazake. Amazake is a traditional sweet beverage in Japan and is made with Malted Rice. Now it is commonly consumed as a warm drink on Girl’s day celebration or cold days in winter; however, it is said that Amazake has basically consumed as a cold drink to cool body down in summer. We are proudly introducing our Amazake which is made with sweet potato. Its sweetness is only coming from malted rice (the starch is converted to sugar) and of course no sugars are added- very healthy and naturally tasty. Furthermore, it is non-alcohol beverage so all generations can enjoy it. The flavor of Sweet Potato Amazake is superior when consuming as a cold beverage. Please enjoy as it is, diluted with water, soda, milk, or soy milk, adding ginger or yogurt, or Shochu if you prefer to drink alcohol.